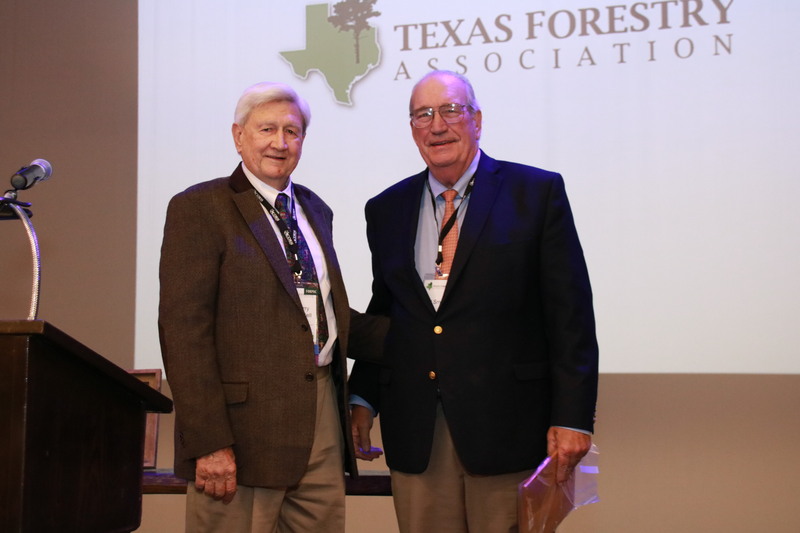 LUFKIN, TEXAS – Texas Forestry Association has named Ed Small as the recipient for the Ed Wagoner Leadership Award at the Association’s annual convention held at The Fredonia Hotel in Nacogdoches, Texas on October 25-27, 2017. Small received the award in honor and recognition of his leadership, time and personal attention to the success of the many TFA programs. He has been a TFA member since 1995 and has provided his professional services as an attorney and lobbyist to the Association for over 20 years. In addition, Small led efforts for two years to make a rule change to the Texas Commission on Environmental Quality for easier performance during prescribed burns while maintaining air quality regulations. He has also provided his legal services when TFA members required assistance with positive results. Ed Small accepts the Ed Wagoner Leadership Award during the annual convention for the Texas Forestry Association held at The Fredonia Hotel in Nacogdoches, Texas on Oct. 25-27, 2017. Presenting the award is Dr. Jerry Marcontell.